By 1721, the very lifeblood of New France, the fur trade, was on the brink of disaster. The market in France was glutted and fur shipments were no longer being accepted. The King (Louis XIV) had tried in many ways to establish industry in the colony and control it to his benefit but had largely failed, at times because of lack of materials, at times lack of industriousness on the part of the colony itself. Various monetary systems were tried, even to the point of creating “card money” yes, literally marking playing cards with a stamp. It did not take long for some of the men in the colony, who became known as the “coureurs des bois”, already hardened by the fur trade, to start trading for themselves. They knew they would have to compete with the Indian fur traders and to this end, ventured further inland looking for new trapping grounds thus stimulating western exploration. The royal reaction was to turn these men into outlaws and create trading licenses. Each license allowed the departure of two canoes loaded with goods. Only one canoe was allowed afterwards bearing 3 men and 400 pounds of freight. The licenses were sometimes sold for the profit of government and sometimes given to widows of officers, the hospital or other people in need. At times, they would be sold privately to merchants or voyageurs. The licenses were valid for a year and a half, with each canoeman sharing in the profits which could be considerable, providing you didn’t drown first. The bane of the fur trade was the running off of the young men into the woods, at one time 800 disappeared following the call of Daniel Dulhut. The fear was that they would not resettle and help to build the colony. The way of life was one of adventure and freedom, many adopting the ways of their native brothers. Unlike the natives though, they had a better capacity for the brandy which was part of the trading deal. An inebriated Indian could always be cheated in an unfair trade deal. It was considered to be one the “tools of the trade”. The reason this continued was the fear of losing the young men to the English traders or driving them away from the Church. The King had ordered that whipping and branding be given for the first offence of trading without a license and being sent to the galleys for the second offense. Nothing the intendant Duchesneau did could prevent the debauchery and lawlessness. Therefore, siegneuries were abandoned, wives left behind and children ran about in the streets as men gathered and disappeared into the forest. They could be gone for years out of the reach of the law. Montreal was the headquarters for the fur trade. When a party of “coureurs des bois” returned, the settlement would turn into a place of revelry and debauchery. The men would bedeck themselves in a blend of French finery and Native decoration, always with a sword at their side, the women following suit. Of course, after the celebration was over, confessions were heard and penances issued for the Church could not afford to lose any more souls. One of the most famous coureurs des bois was Daniel Greysolon Dulhut who was a noblemen and career soldier from Lyon, France. His mission was to create a peace between the western Indian tribes and the French while fortifying areas that were under threat by the English and Iroqouis. 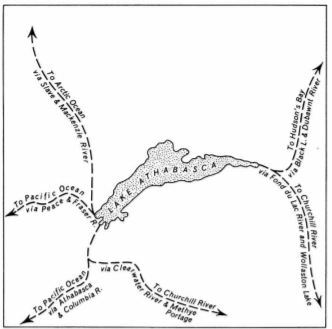 To this end, he fortified the fort at Michillimakinac, Michigan and built Fort William on Lake Superior and later, Fort St. Joseph. He made an enemy of the intendant Duschsneau for disobeying the orders of the King and was slandered by La Salle in order to gain a monopoly on exploration rights for New France. 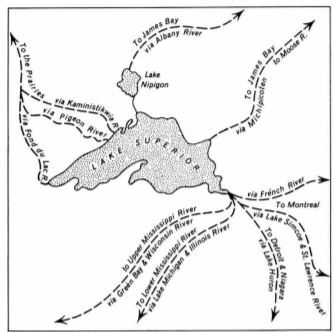 In spite of this, he was able to secure the authority of New France in the Great Lakes area. He died in Montreal in 1710, leaving a part of his fortune to Charles Delauney who had cared for him. The city of Duluth, Minnesota is named after him. It is likely that at this point, the ending of the 17th century and with the rise of the coureurs des bois a new nation started to form in New France, that of the Metis as they took “country wives”, women they had children with but did not marry. Eventually, the coureurs des bois would fade away and in their place came the “voyageur”, a man whose business it was to legally transport goods up into the “pays des haut”. There were several voyageurs in the family of which I would like to find out more. For now I will just list some. Francois Beauchamp, Michel Beauchamp, Joseph Beauchamp, Antoine Beauchamp, Pierre Beauchamp, Augustin Beauchamp, Hubert Beauchamp and Jean Beauchamp, very likely the son or grandson of our original settler. There were also voyageurs in my grandmother’s family (Daigneault), Richard Daigneault was one of them. 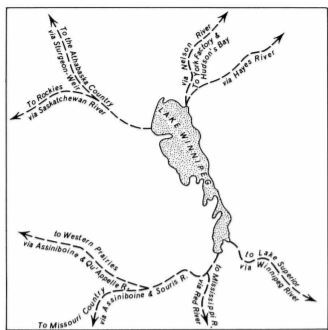 Below are some maps of the fur trade hub lakes taken from a book by Eric Morse, Fur Trade Routes of Canada/Now and Then. This entry was posted in The Family in Canada and tagged Beauchamp, History of Quebec, New France, Voyageurs in the Family by Shamwest. Bookmark the permalink.